It is as if the clouds are dancing or brilliant white fireworks are going off in the sky. I love the movement in the clouds. For a bigger image, please click here. I love “The Love” between these two animals. They are gorgeous and magnificent horses. They are Splendid in form. I will assume they are twins and so therefore twin souls. 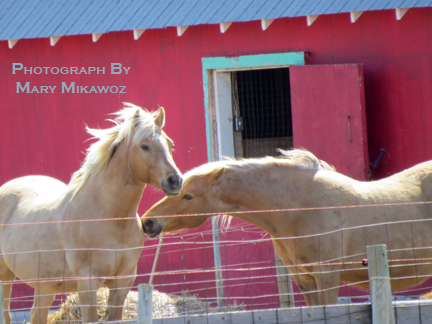 I have other cute images of the horses being close and loving to one another. First the one shows affection, then the other shows affection and sometimes, it is as if they embrace or show love at the same time to each other. Please press on this link to see a bigger image. Thank you for checking out my photographic work. 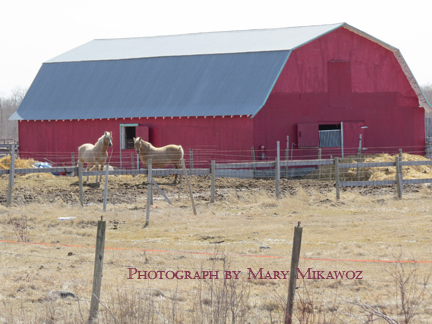 These are gorgeous blonde horses in front of their home beside a brilliant red barn. I am not sure how they are related whether two brothers, two sisters, brother and sister, mother and son or daughter, or father and daughter and son. Maybe they are twins or are they just friends sharing a farm together. Whatever the familiy relationship, they are just gorgeous horse specimens.